Creamy Lemon Parmesan Potato Salad. 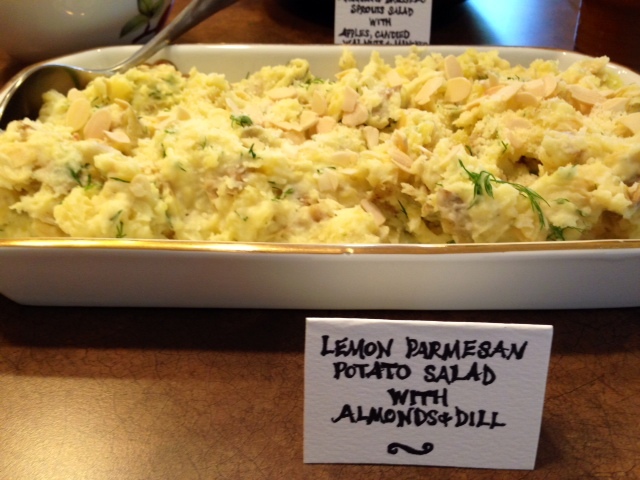 Reduced-Fat Yukon Gold Potato Salad With Lemon, Parmesan, Dill & Almonds. This potato salad was one of the most popular dishes from the baby shower. This recipe is almost identical to an old recipe of mine from a couple of years back but with a few tweaks. This dish tastes so rich and indulgent, but it’s actually fairly low-fat and has no mayo, butter or oil! It’s a great side dish for a party or BBQ. Yum! Serves up to ~8 depending on portion size. Boil the potatoes in a large pot for about 20-25 minutes until soft and break apart easily with a knife. Drain the excess water and return the potatoes to the pot, cutting the potatoes into smaller, rough cut pieces with a knife. While the potatoes are still hot, add in the sour cream, Parmesan cheese, lemon juice, dill, almonds and season with a dash of salt/pepper. Stir well to combine all the ingredients. You can serve the potato salad warm or room temperature. bad idea to add (turkey) bacon? I may give it a shot, will let you know how it comes out. bacon is never really a bad idea..